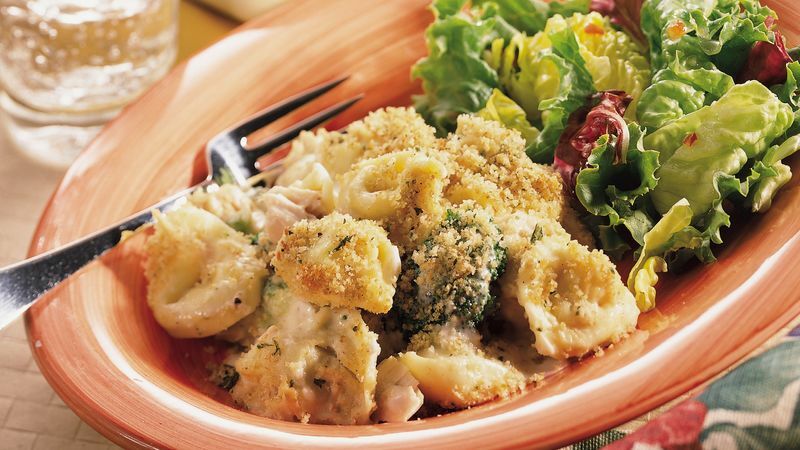 Cook tortellini to desired doneness as directed on package, adding broccoli during last 4 minutes of cooking time. Drain; return to saucepan. Add Alfredo sauce and tuna; mix well. Cook and stir over medium heat until thoroughly heated. Spoon into ungreased shallow 1-quart casserole or gratin dish. In small bowl, combine butter and crumbs; mix well. Sprinkle over top. Broil 4 to 6 inches from heat for 1 to 2 minutes or until topping is golden brown.